It has been the biggest of its kind for some time now, and this year it got even bigger. The stage is set for the Econet Victoria Falls Marathon this Sunday, July 1, 2018, with the mighty Victoria Falls, one of the Seven Natural Wonders of the world (also known as ‘The Smoke That Thunders’) providing an epic backdrop to the event, amid the surrounding wildlife. Now in its 12th year since the inaugural event in 2006 which, attracted 300 runners, this year’s event looks set to provide its own ‘thunder’ and ‘wonder’, with over 2.500 athletes registered and expected to push themselves hard, in the ultimate test of endurance in Zimbabwe’s popular, tourist resort centre of Victoria Falls, on a route that includes running across a bridge marking an international border. “We are proud to be supporting this great event for a 6th year running,” said Econet Wireless Zimbabwe CEO Mr Douglas Mboweni. “We are happy with the rising level of both the local and international participation at this event, and are excited by the tourism dividend it brings to the travel, tourism and hospitality industries, ” said Mr Mboweni, as organizers say they expect more than 40 different nationalities to be represented at the marathon. The Marathon has grown over the years to attract a regional and international field of runners – often travelling with their families and friends – who participate in the three categories of the 42km Marathon, the 21km Half Marathon, and the 7.5km Fun Run. Mr Mboweni said this year the Econet group had thrown the full weight of its subsidiary companies and top brands in support of the marathon and in support of the all the opportunities it brings. He said the Econet mother brand maintained the overall naming rights to the full and the half marathons, while EcoSure sponsored the ‘Fun Run’ and Steward Bank got behind the ‘Team Relay Challenge’. He added that Kwese was also involved in giving media support and coverage of the event. Mr Mboweni said Econet, the mobile telecoms giant that in recent years has transitioned into a telecoms, media and technology (TMT) company, was also using its innovation and tech competences to roll out products that support wellness and healthy lifestyles. “Through the EconetConnectedHealth suite of products, we now offer a variety of health and wellness packages and accessories, that empower people to monitor their vital signs and take appropriate, timely interventions,” said Mr Mboweni. 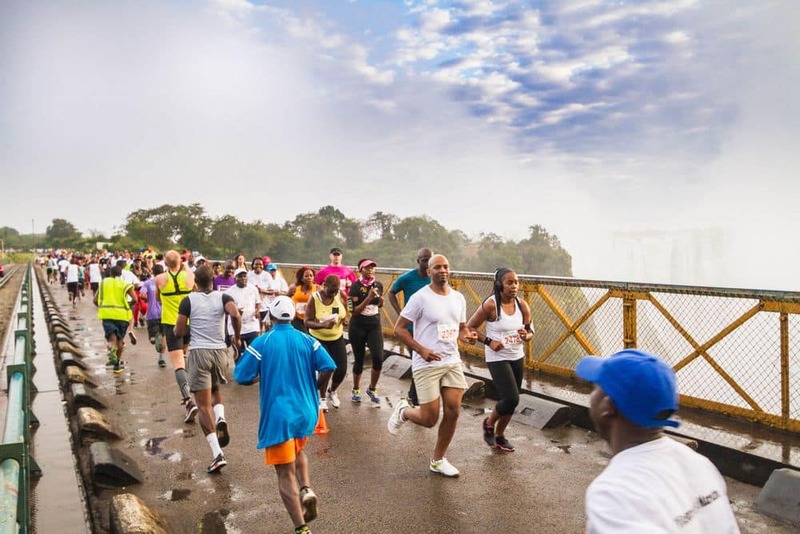 “But beyond that, we actively collaborate with various partners – such as the organizers of the Victoria Falls Marathon – to sponsor and support a healthy lifestyle”, he said, stressing the importance of adopting wellness as a lifestyle. Econet’s foray into health and wellness is however not confined to the Victorial Falls Marathon and to EconetConnectedHealth products and services only. Last year, speaking at a Wellness function in the capital Harare, Mr Mboweni said Econet had elevated wellness to a strategic level within its business, complete with an executive head that drives its implementation. Mr Mboweni said the 6-year sponsorship of the Econet Victoria Falls Marathon demonstrated that the company sees employee and public wellness not as a once-off event, but indeed as a marathon. “As a business organization, we take a long-term view to our investment in the various sectors of the economy where we serve, and we take a similar view to our investment in people’s health and wellness,” said Mr Mboweni. Econet Wireless, which happens to be celebrating its 20th anniversary of operations in Zimbabwe, secured another 20-year licence to operate in the country following its payment of a US$137,5 million licence fee in 2013. Said Mr Mboweni: “For us, our commitment to our customers, to this market and this economy, even as we celebrate our 20 years in business, is not a sprint, but a marathon. We take the long term view, and are in this for the long haul”. Mr Mboweni said he wished a great and fulfilling race for all the runners at this year’s event. “On behalf of the Econet group, and on my own behalf, I would like to convey my best wishes for a great, safe and fun-filled run to every participant at this year’s event,” he said, congratulating first-time participants for “choosing to live a healthy lifestyle”.